As we cut up vegetables for a winter stew this morning, I find myself grateful for composting! It’s not hard to do. 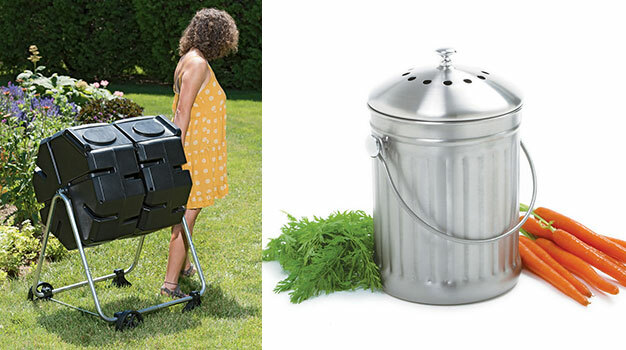 If you don’t enjoy getting your hands dirty, you can make a one-time purchase of a turnable compost bin (which can be placed right outside your back door … and you can roll it away if you don’t like it out for company). Inside the house, a compost pail receives all your food scraps (no meat, no bones, no invitations for raccoons and other foraging critters). You can even purchase biodegradable liner bags for the pail so you can lift the scraps out and take them to the compost bin. No mess! Turn the compost several times and wait until it becomes black gold. Spread it over your garden as a marvelous soil amendment. If you don’t have a garden, cast it over your lawn. Your lawn will find it yummy. And if you don’t have a lawn or a garden, many areas in the country have a community compost service. We keep trying to reduce what we put into the waste stream. It’s all about saving our Earth and every little bit each of us can do will help.